No longer, they say, do living rooms need to be kept at 21°C and bedrooms at 18°C, as used to be advised. Now all rooms can be kept at 18°C with “minimal risk” to the health of “a sedentary person wearing suitable clothing”. It’s a rethink of just three degrees but, as with outdoor climate change, a few degrees of indoor climate change can make a significant difference. Such a review was long overdue. The World Health Organisation advice that standards were based on was more than 30 years old, and the accumulation of evidence over time (although limited) warranted another look. Under 18°C evidence shows that the health risks increase, particularly for those with cardio-respiratory disease, and for older people who spend a lot of time at home and may not perceive cold temperatures due to physiological changes that occur with ageing. But the evidence that 21°C was a significant threshold, even for those most vulnerable, was found wanting. So good scientific governance. But it is also a recognition that room temperature can have an indirect impact on health. If people keep their living rooms at 21°C because they feel they ought to, they will spend more on their energy, potentially getting into financial debt and other forms of hardship that have health and well-being implications. Higher room temperatures also more mean more energy demand and more carbon emissions, so the longer term health effects of climate change also need to be factored in. All sound and balanced thinking. Keeping warm and healthy depends on many other factors. Our bodily temperature is also the result of the clothes we wear, what we eat and drink, how active we are, all in a systemic interaction. So Public Health England says that younger people who are healthy and active and able to “layer up” should be fine with lower than 18°C. And overnight certainly the 18°C threshold is less important for healthy people if they have sufficient bedding, clothing and use thermal blankets when necessary. “Layering up” advice is territory where others have come unstuck. 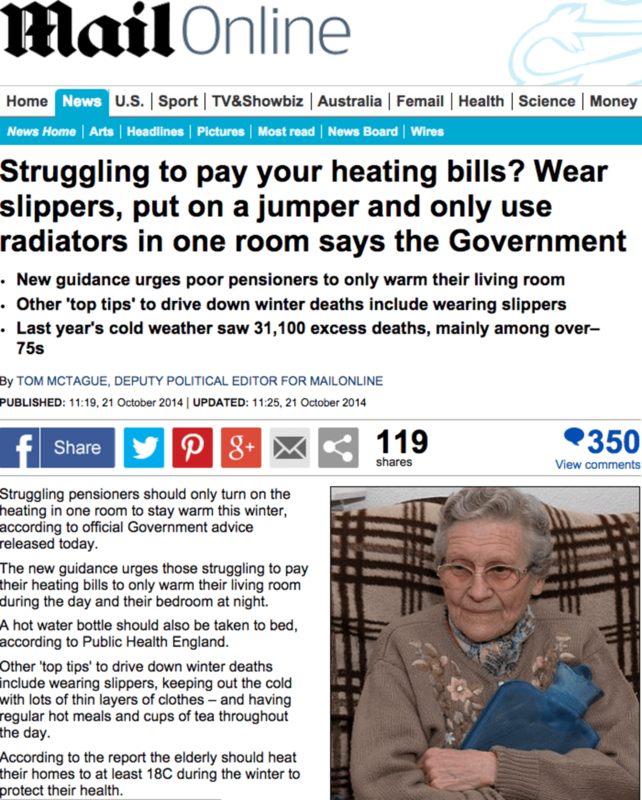 In an ongoing analysis of newspaper reporting of energy issues we are finding a pretty universal castigation of any suggestion made by politicians and energy companies that people should wear more clothes or put another blanket on the bed. Who are the prosperous and profiting to tell others how to live? The messenger matters, clearly. 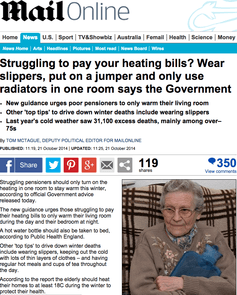 The Mail rejects slippers and jumpers advice. Public Health England should get an easier ride, but the organisation still concedes, “we know that people have strong feelings about their homes and don’t want to be told what to do in them”. Such are the political sensitivities nowadays around even common sense health advice entering the domestic sphere. The rethink on the “need” for room temperatures could have implications for government policy which currently defines being fuel poor as the energy required keep the main living area at 21°C (along with “required” energy for other purposes such as lighting and hot water). Should this threshold now shift to 18°C? Maybe, but careful consideration is needed. The guidance notes that older or less healthy people can benefit in medical terms from a “slightly” higher room temperature. If fuel poverty policy is about protecting the most vulnerable under all circumstances, then 18°C may well not be sufficient. In other respects the advice might not have got the balance quite right. They recommend keeping a bedroom temperature of 18°C overnight for people older than 65 or with pre-existing medical conditions, as this “may be beneficial” to protect their health. The health evidence here is not so strong (hence the “may”), and if taken seriously would mean keeping home heating systems on overnight in winter. Research shows this is far from standard practice for most households, and particularly for people on low incomes, so would imply increased energy costs of the form that elsewhere Public Health England says it is keen to avoid. There are also questions about energy rights, or energy justice more broadly. The new guidance says the 18°C threshold is relevant for everyone. Does it then follow on health grounds – as well as on the grounds of meeting what has become a basic human need – that there should be no longer be any disconnections by electricity and gas suppliers? This was one of the demands of the Energy Bill of Rights recently launched by Fuel Poverty Action at the House of Commons. There are already regulatory and best practice provisions that limit the circumstances and times of year during which certain categories of households can be disconnected by energy suppliers. But if all people need to be able to achieve 18°C (or near to this) at home to minimise health risks, then shouldn’t the “right to not be cut off” be universally applied? Since 1999, home water disconnections have been banned on health grounds. If “room temperature” is truly vital to health, maybe it is time we banned energy disconnections as well. This article was originally published on The Conversation, 4 November 2014. This entry was posted in Online Writing, Writing by DEMANDers and tagged temperature, The_Conversation, Theme 5. Bookmark the permalink.